Alan Phillip Gross (born May 2, 1949) is an American international development professional. In December 2009, he was arrested while in Cuba working as a U.S. government subcontractor for the U.S. Agency for International Development (USAID) as part of a program funded under the 1996 Helms-Burton Act. He was prosecuted in 2011 after being accused of crimes against the Cuban state for bringing satellite phones and computer equipment (to members of Cuba’s Jewish community) without the permit required under Cuban law. After being accused of working for American intelligence services in January 2010, he was ultimately convicted for “acts against the independence or the territorial integrity of the state" in March 2011. He was released from Cuban prison on December 17, 2014. ↑ "American Alan Gross Completes 5th Year in Cuban Prison". VOA. Retrieved December 17, 2014. ↑ "Wife Says Alan Gross' Health, Spirits Failing; Worried He'll Do 'Something Drastic'". Fox News Latino. Retrieved December 17, 2014. 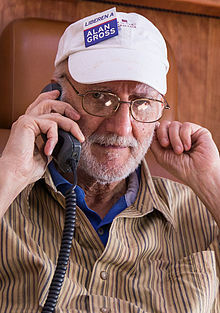 ↑ "White House renews call for Cuba to release Alan Gross". Fox News Latino. Retrieved December 17, 2014. ↑ "American Alan Gross completes fifth year in Cuban prison". Reuters. Retrieved December 17, 2014. ↑ "IMMEDIATE AND UNCONDITIONAL RELEASE OF UNITED STATES CITIZEN ALAN PHILLIP GROSS". Congressional Record (United States Government Printing Office) 158 (155). December 5, 2012. http://www.gpo.gov/fdsys/pkg/CREC-2012-12-05/html/CREC-2012-12-05-pt1-PgS7637.htm. ↑ "Sentence" (PDF). People's Provincial Tribunal of Havanna. This page was last changed on 30 August 2017, at 20:17.